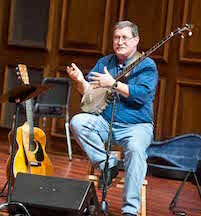 Blackstone River Theatre will offer BEGINNER 5-STRING OLD-TIMEY BANJO from 1:00 to 2:00 PM and ADVANCED BEGINNER 5-STRING OLD-TIMEY BANJO with Ed Sweeney from 2:00 to 3:00 PM on Saturdays, April 27, May 4, 11, 18, 25 and June 1. These will be small group classes geared toward adults or teens age 16-and-up. Fee is $90 per student per six-week session. Minimum three needed to hold class. Maximum 6 students. In these classes you will learn the basics of playing the old-time Appalachian banjo style including tuning, ornamentation and basic frailing to drop thumb melodic playing. We will work on ear training and as we progress, discover the many different tunings of old timey banjo and why one would want to use different tunings. Participants must bring their own 5-string banjo!